Founded in 1919 to serve the Netherlands, KLM is the world’s oldest airline. Part of the Air France KLM Group since 2004, it is a European airline industry leader known for its reliable, pragmatic and innovative service. KLM’s goal was to refining personal communication, making its customer experience even better by making it easier for people to talk to its agents via social media. It also wanted to expand its social media services. 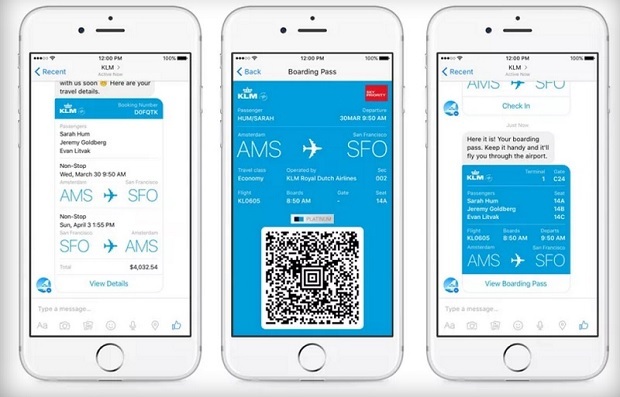 KLM wanted to make it easier for customers and agents to have meaningful conversations, without compromising privacy. The airline knew that its customers spent a lot of time on Facebook and Messenger, making them ideal communication platforms. But KLM also knew that people are not allowed to share sensitive travel information on its Facebook Page. So KLM added the “Send Message” button to its Page, allowing people to quickly, seamlessly and privately communicate with its agents. This action resulted in an instant 40% increase in Facebook messages from customers, so KLM collaborated with Digital Genius to implement artificial intelligence (AI) for its social media channels—including Messenger—to respond to the growing number of messages. When agents receive a question from a customer, they are given a proposed answer through AI (which is trained to answer more than 60,000 questions). The agent decides whether the answer is the right one, makes any necessary adjustments, and replies through the appropriate social media channel. The system learns, based on the agent’s action, and becomes smarter in real time. The airline also uses Messenger to share flight information with customers, such as booking confirmations, check-in notifications, boarding passes and flight status updates. To measure customer satisfaction, KLM sends a survey through Messenger at the end of each conversation, using a standard question to ensure that the results are compatible with its surveys on other channels: “Are you satisfied with our social service? On a scale of 1-10, how likely are you to recommend KLM to a friend?” The preliminary survey results revealed that KLM’s Messenger services received the highest satisfaction scores (Net Promoter Score, or NPS), compared to other social channels. Karlijn Vogel-Meijer, Director of Social, KLM, said: "Messenger gives our customers the opportunity to talk to us throughout their entire journey. We believe we can strengthen customer relationships by being where our customers are, which is Facebook and Messenger. Our next initiative is to allow people to book directly on Messenger".